With the Washington Capitals playing in Washington D.C., you'd think it be easy to visit the White House and show off the Stanley Cup. Well, on Tuesday the Capitals finally said a visit to the White House to celebrate the franchise's first Stanley Cup win last season is set. It's been a tricky year for all the 2018 season champions, largely due to the government shutdown that took place earlier in 2019. The Red Sox postponed their trip until May, while the Warriors are not visiting at all. The Capitals had some differing opinions on whether or not they would visit, with Alexander Ovechkin telling The Washington Post in June, "Yeah, looking forward. Can't wait. I've never been there. Only taken pictures around it. It will be fun." Then-coach Barry Trotz, who is now with the Islanders, told The Post, "I have my opinion on that which is part of the process of being a championship team, and other people have different opinions, so I respect both. I haven't talked to the guys one way or the other. We haven't had any official team meetings, but I respect both sides, really I do. Whatever the group decides, we will do it. I don't know if it will be a full group, a half group, or no group, I have no idea. I think most guys have the tradition part down." 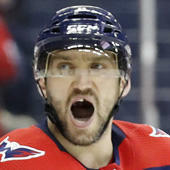 The only question now is what kind of food will the Capitals be served at the the White House.